The victory vaulted her from No.3 to No.1, dethroning Yani Tseng’s reign at the top of the Rolex Rankings. Tseng was No.1 in the world for more than two years, culminating in 109 weeks at the top. Lewis has won seven LPGA events in her career, six of those coming in her last 23 starts. Thats a winning percentage of over 20 percent, which any golfer can tell you is an incredible number to achieve. The LPGA schedule goes from Arizona to Carlsbad, California this week, where Lewis will go for a third-straight victory. She is playing for the first time as the No.1 ranked player in the world, and has certainly sparked an exciting time for women’s American golf. 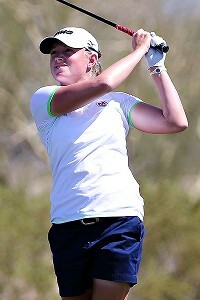 Lewis is just the second American woman to be at the top of the Rolex Rankings. Back in 2010, Christie Kerr had a short time at the top of the rankings. How long Lewis will hold on to this spot remains to be seen. If she continues to play the way she has been over the course of the last year or so, it will be very difficult to catch her. And there is no reason to think that the 28-year-old will slow down anytime soon. Lewis does have a Major Championship win to her credit as well, capturing the Kraft Nabisco Championship back in 2011, so we know that she is capable of winning the biggest tournaments out there. The Major Championships for the LPGA will be coming up over the coming weeks and months, and Lewis will certainly be the focal point when the time comes. It’s good to see a great American player like Lewis get to the top of the rankings. Young American female golfers all around the United States should pay attention to this player, and appreciate what she is doing right now. As a matter of fact, golfers everywhere should.